Students review author’s purposes—to persuade, to inform, and to entertain. Then, they read an article and identify the author’s purpose for writing the text and the text features that were added to improve comprehension. Next, they examine different text structures that can be used in informational writing. Finally, they analyze a persuasive text. In this experience, students review author’s purposes—to persuade, to inform, and to entertain. Then, they read an article and identify the author’s purpose for writing the text and the text features that were added to improve comprehension. Next, they examine different text structures that can be used in informational writing. Finally, they analyze a persuasive text. Explain the author's purpose and message. Analyze how the author uses text structure to achieve purpose. Two class periods. You may choose to have the students read the articles at home before beginning the experience. Authors have various reasons why they write things. As a reader, you have to look for clues in the text to figure out what that purpose was. 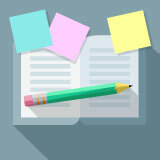 In this experience, you will explain author’s purpose and identify how the author used various text structures to help the reader better comprehend a text. Think about the last thing you wrote. What was it? Why did you write it? Discuss the variety of reasons students write throughout the day.